Spend the 23rd (Thu) exploring nature at Mirima National Park. Next up on the itinerary: explore the wealth of natural beauty at El Questro Wilderness Park, contemplate the waterfront views at Ord River, explore and take pictures at ZEBRA ROCK MINE GALLERY & CAMPGROUND, and browse the exhibits of Waringarri Aboriginal Arts. 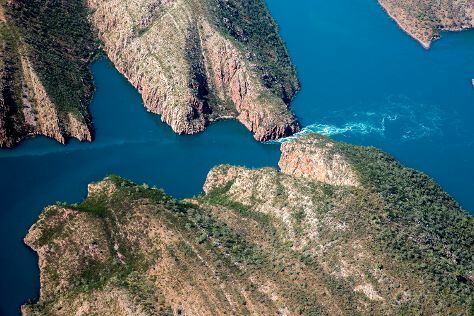 For traveler tips, photos, more things to do, and other tourist information, you can read our Kununurra day trip tool . Sydney to Kununurra is an approximately 11-hour flight. You can also drive; or do a combination of train and bus. Traveling from Sydney to Kununurra, you'll gain 2 hours due to the time zone difference. When traveling from Sydney in May, plan for much warmer days in Kununurra, with highs around 39°C, while nights are somewhat warmer with lows around 20°C. Wrap up your sightseeing on the 23rd (Thu) early enough to travel to Purnululu National Park. Kick off your visit on the 24th (Fri): look for all kinds of wild species at Purnululu National Park and then take in the dramatic natural features at Bungle Bungle Range. For photos and other tourist information, go to the Purnululu National Park trip planner . Traveling by car from Kununurra to Purnululu National Park takes 6 hours. Cap off your sightseeing on the 24th (Fri) early enough to travel to Talbot Bay. Kick off your visit on the 25th (Sat): admire the sheer force of Horizontal Falls. To find other places to visit, ratings, maps, and more tourist information, use the Talbot Bay tour planner . The Route module can help you plan travel from Purnululu National Park to Talbot Bay. On the 25th (Sat), wrap the sightseeing up by early afternoon so you can travel to Derby. Derby is a town in the Kimberley region of Western Australia. On the 26th (Sun), don't miss a visit to Boab Prison Tree, admire the masterpieces at Norval Gallery, then take a leisurely stroll along Derby Jetty & Wharf, then get engrossed in the history at Wharfingers House Museum, and finally enjoy the scholastic atmosphere at Kimberley School of the Air. Here are some ideas for day two: contemplate the waterfront views at Manning Gorge, take in the exciting artwork at Mowanjum Art and Culture Centre, and then explore the striking landscape at Galvans Gorge. For ratings, reviews, maps, and more tourist information, go to the Derby visit planner . Use the Route module to find suitable travel options from Talbot Bay to Derby. In May, daily temperatures in Derby can reach 39°C, while at night they dip to 22°C. Finish your sightseeing early on the 27th (Mon) to allow enough time to travel to Broome. Spend the 28th (Tue) wandering through the wild on a nature and wildlife tour. Next up on the itinerary: tour the pleasant surroundings at Cable Beach, take an in-depth tour of Broome Historical Museum, don't miss a visit to Buddha Sanctuary, and enjoy the sand and surf at Broome Town Beach. To see maps, photos, reviews, and tourist information, use the Broome trip builder website . Getting from Derby to Broome by car takes about 2.5 hours. In May, daytime highs in Broome are 38°C, while nighttime lows are 22°C. Wrap up your sightseeing by early afternoon on the 1st (Sat) to allow enough time to travel back home.